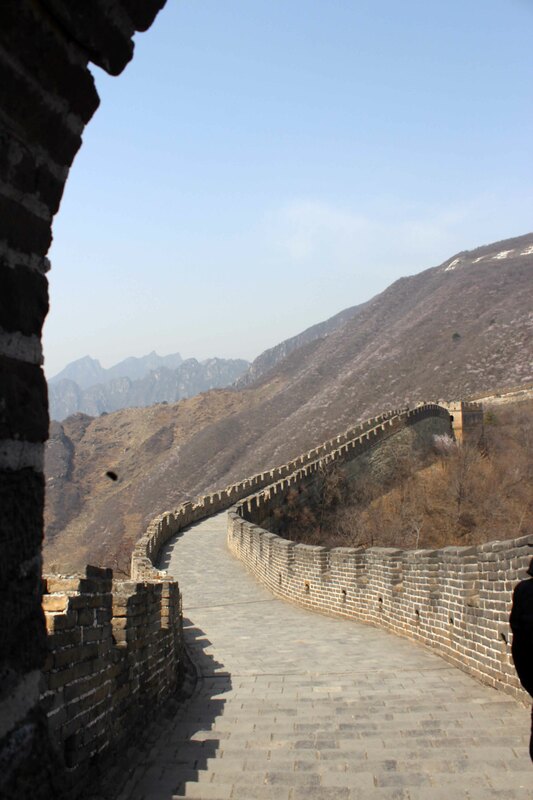 Standing on the Great Wall of China once in a lifetime is a dream for many people and it was a dream of mine for several years. As I now set my foot on one of the biggest and most imposing Monuments on Earth I am speechless. In front of me lies this amazing mighty Wonder of the World which is even visible from space stretching over thousands of kilometres from east to west along the North bound of the country. It is the 15th April 2013. 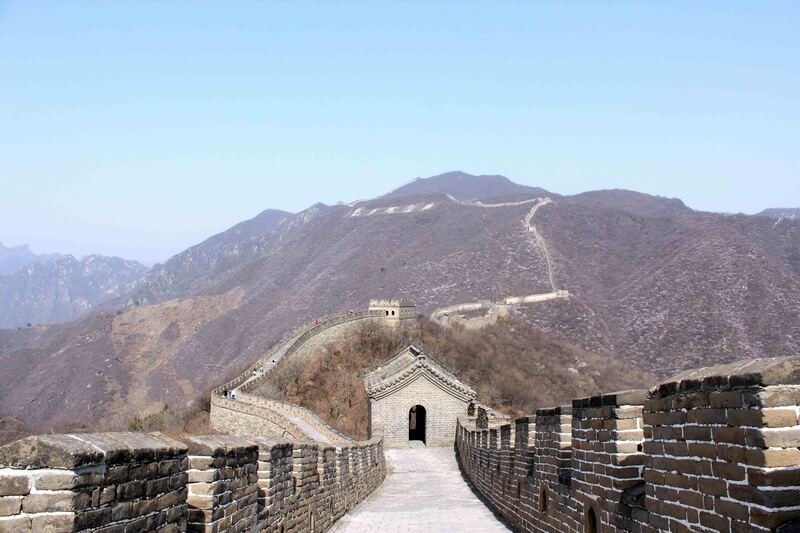 At 9 A.M. we meet in the hotel lobby and take a private bus to the Mutianyu section of the Great Wall which is located 70 kilometres northeast of Beijing. The drive there takes between one and a half to two hours. From the parking space we pass by several shops and local vendors who try to sell T-Shirts, postcards and all other imaginable sorts of souvenirs. One guy has dressed himself up like a mongolian Barbarian and tries to make money through posing with those tourists who want photographs of themselves with him. 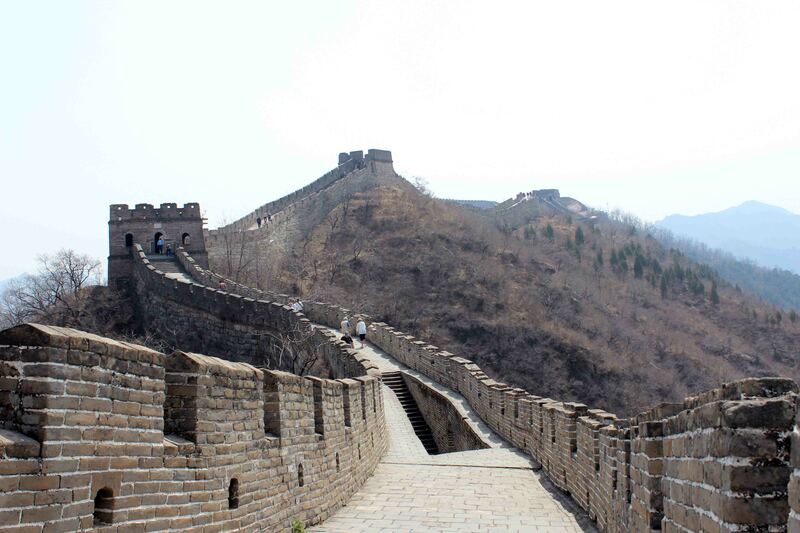 The Great Wall lies high above us. 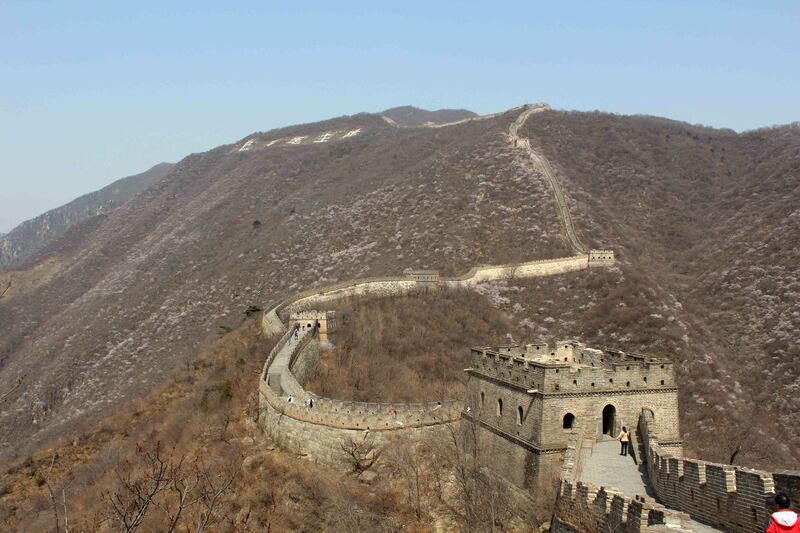 The Mutianyu section is 2.250 metres long and is supposed to be one of the best preserved parts of the Great Wall. 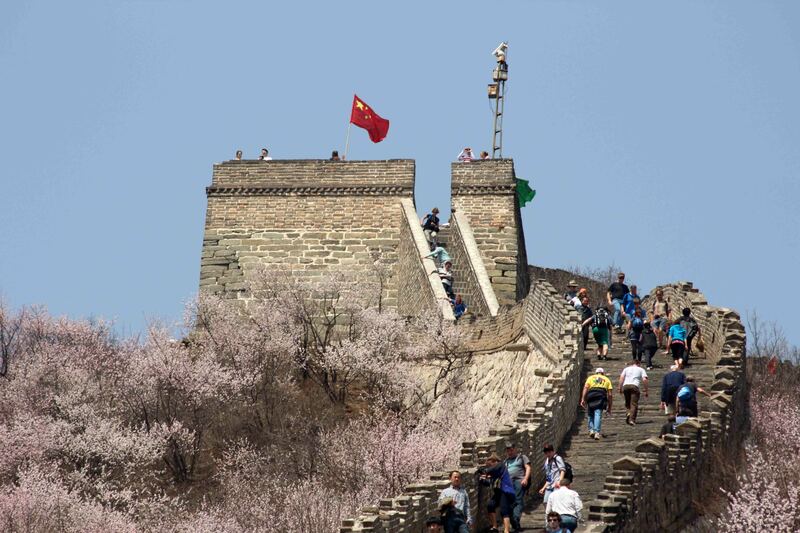 Its construction started in the 6th century during the Northern Qi Dynasty, so Mutianyu is older than the Badaling part where most tourists and package tour groups travel to. 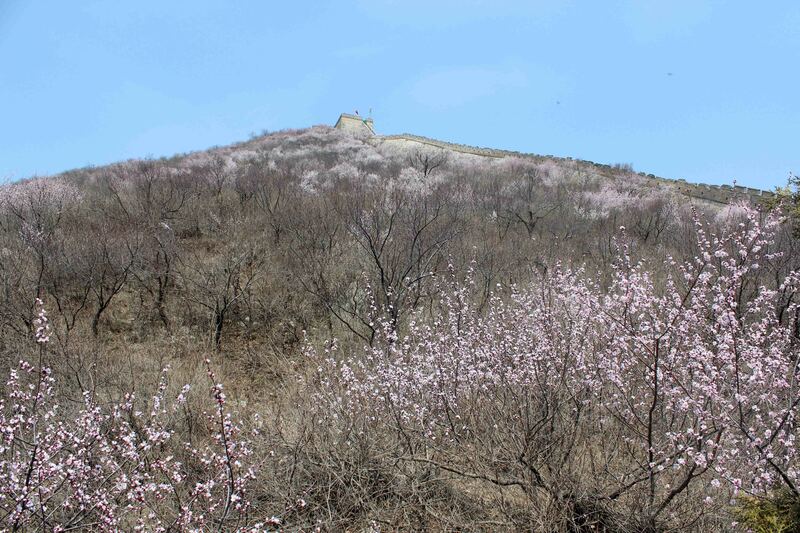 Remarkable in Mutianyu are its 22 Watch Towers. 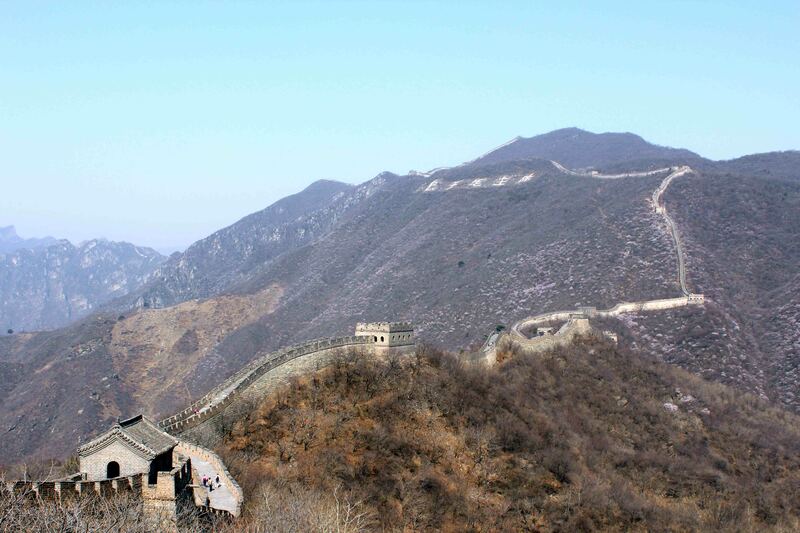 The Great Wall itself here is seven to eight metres high and at the crown four to five metres wide. 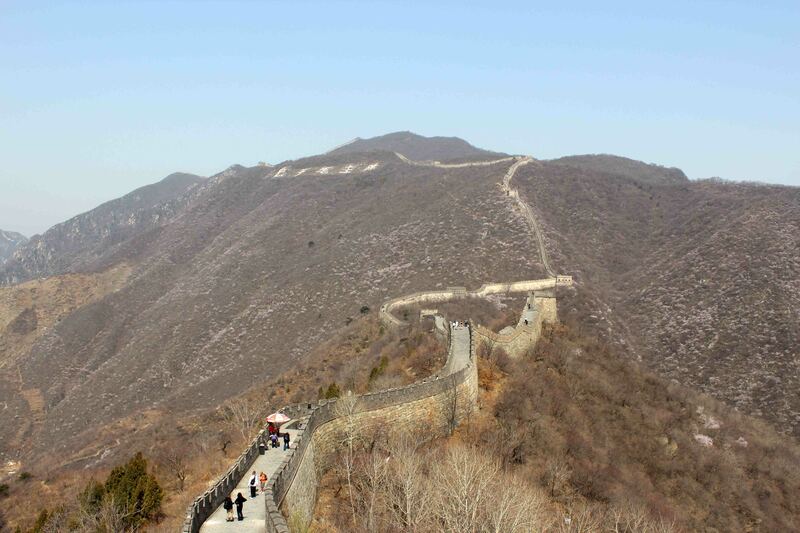 We can choose if we either prefer to take the Cable Car or walk up the many stairs. Five other people of the group and I decide to take the Cable Car, the rest chooses to climb the staircase. 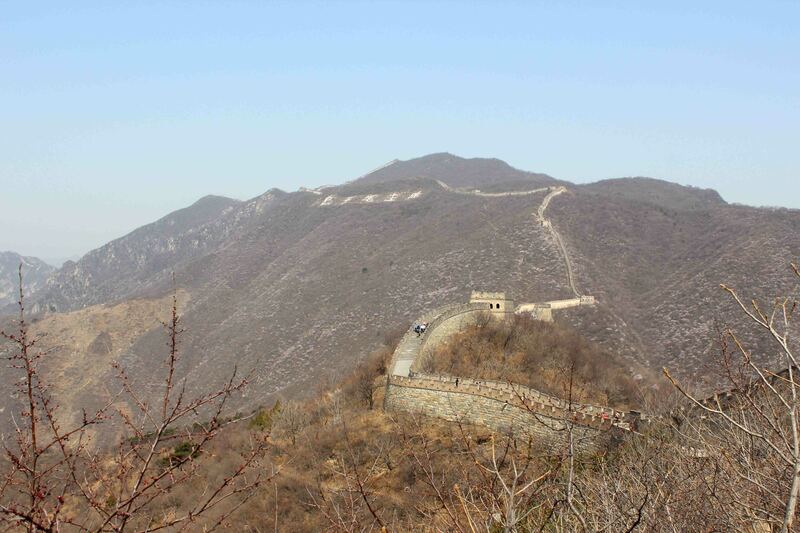 There are two Cable Cars which lead up to the Wall, one which is open like a ski lift and brings visitors up to Tower 6. The other one which we take stops close to Tower 14. 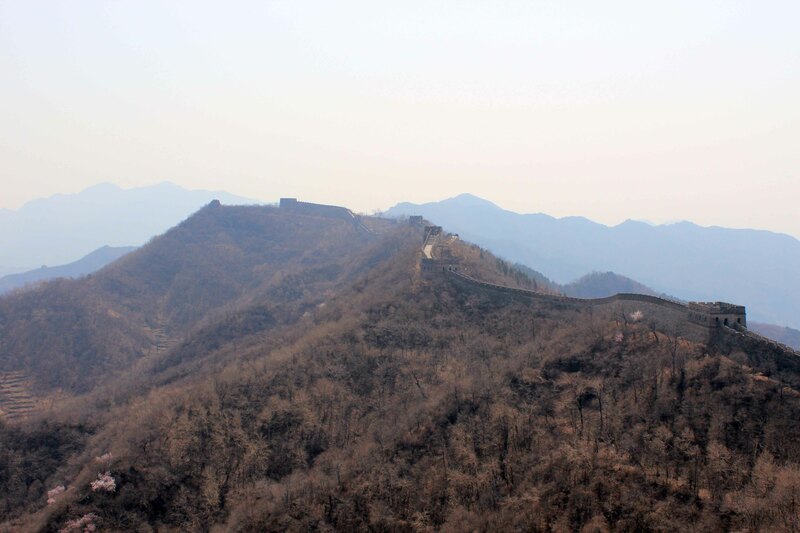 From the cabin we can see the landscape passing by and have a fantastic view on the Wall which is ascending higher and higher. 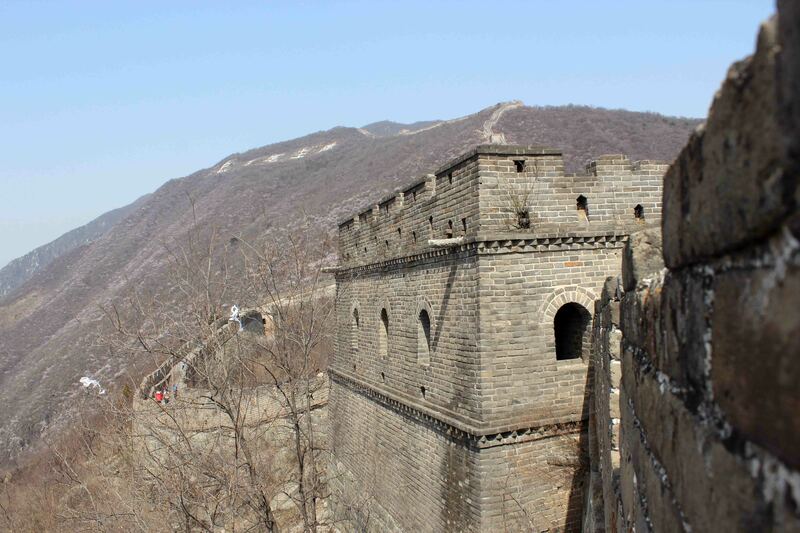 When we get off the Cable Car we have to wait for those walking the stairs so we decide to walk along the Wall a bit and explore the nearby Watch Towers before heading back to Tower 14 to meet the rest of our group. 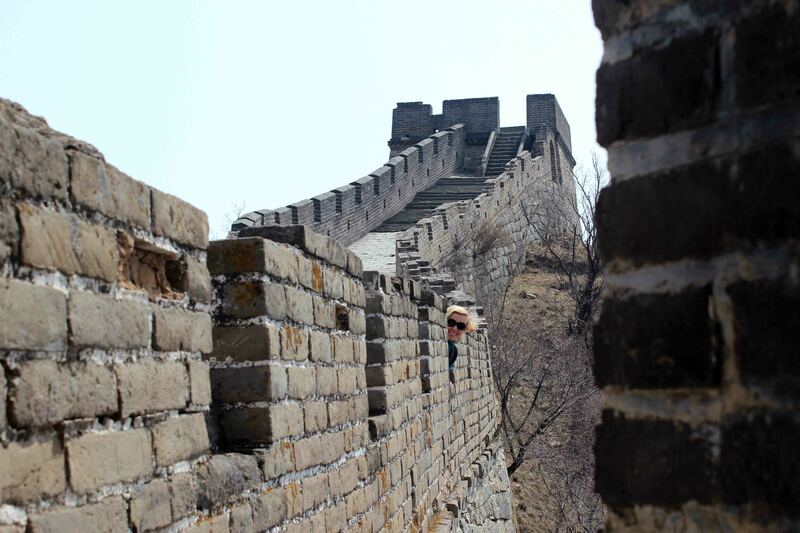 While on the Wall I am conversing with a few of my travelmates. Frances and her boyfriend Jason just started their six-month Round-the-World tour. 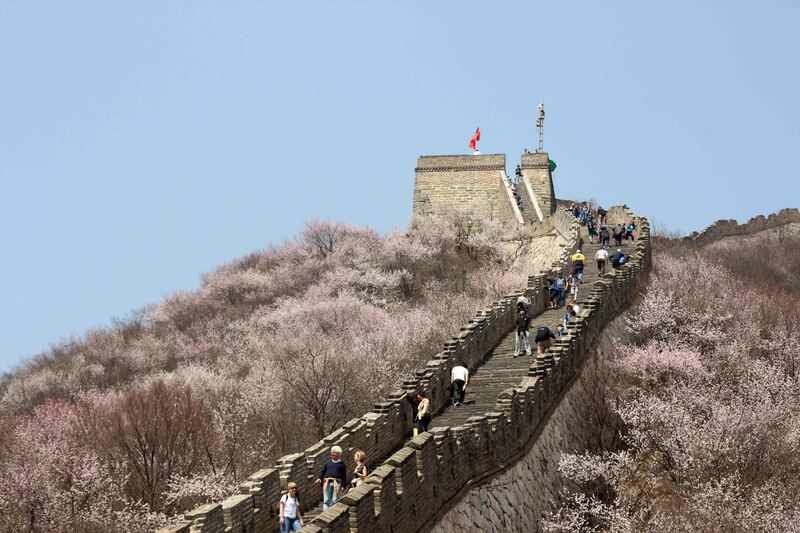 Before their arrival in China they have already been to Japan to see the Cherry Blossoms. Frances’ Dad Terence came to China to do the China leg of their trip with them. Vikki and David are also on a Journey round the World, but they are travelling a few months longer than Frances und Jason and intend to fly home for a wedding in between. Like me, the South African family and Carly, the young british female, have also done adventure tours like this before. 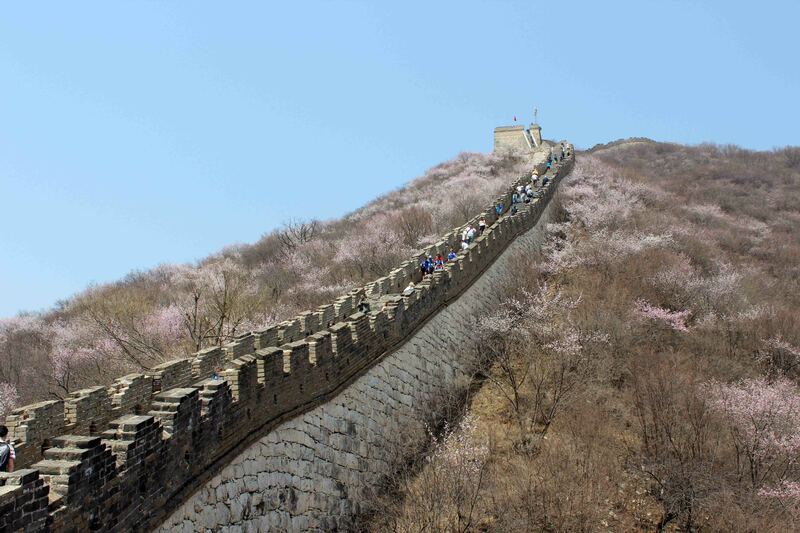 I am walking along the Wall with Leon, our chinese tour leader, for quite a while. 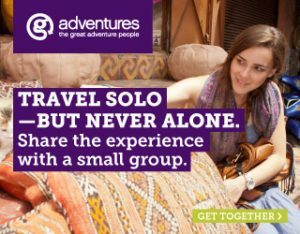 He works for G Adventures since 2009 and has worked for their australian competitor and for a chinese travel company before. We are talking about the tours he led, about trip styles and about what we like respectively dislike when being on the road et cetera. Soon we are accompanied by some local vendours who try to sell us cold drinks, snacks and souvenirs for a relatively high price. 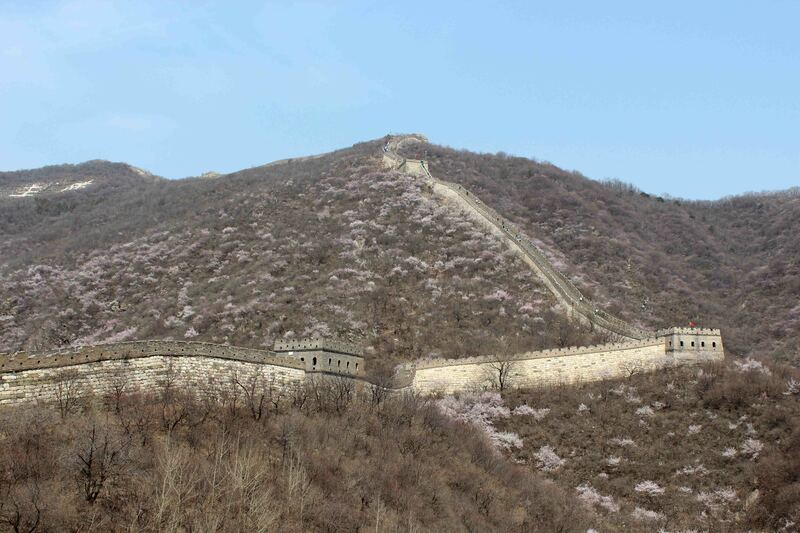 I have already read that on all less touristy parts of the Great Wall people from the nearby villages act as local vendours trying to make money this way. After bargaining with one of them for a while I manage to get a cold drink for a reasonable price. 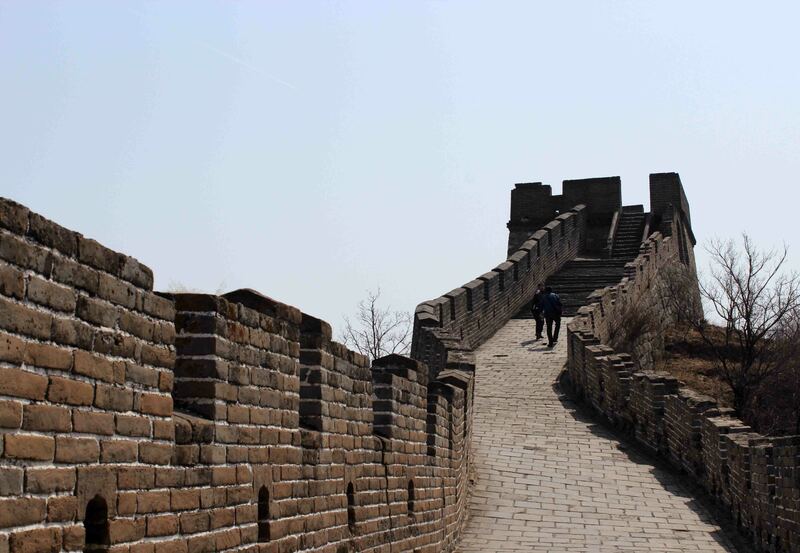 Last night Leon has told us that the Mutianyu section of the Great Wall is a lesser touristy part than other sections, Badaling, for example, and he hasn’t promised too much. 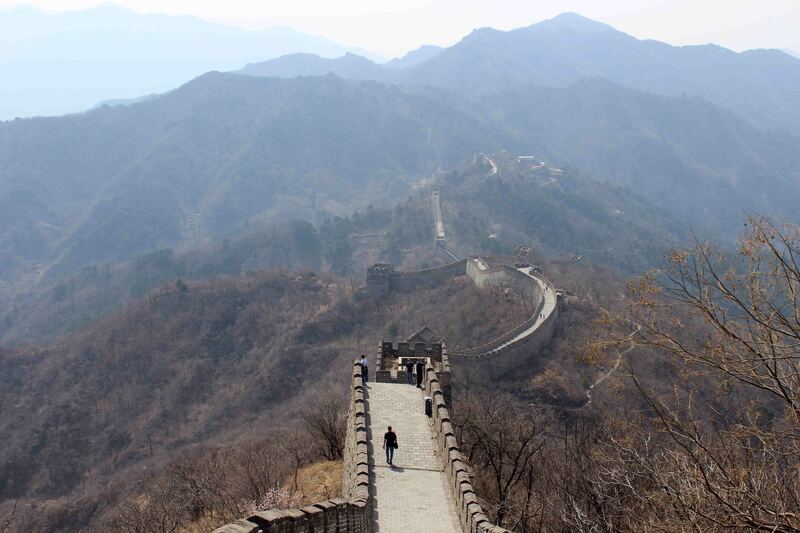 We encounter only a manageable amount of tourists and everyone shows respect to each other. At Tower 20 most of our group meet again. 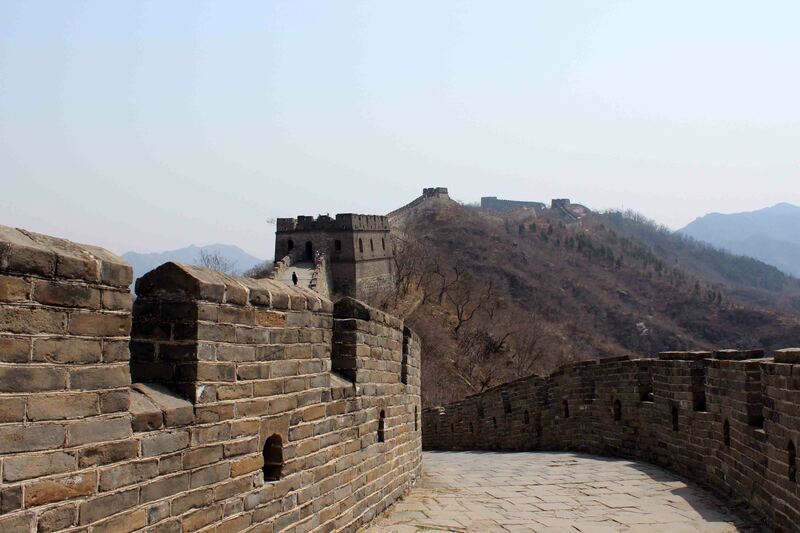 Some of us just take a rest here, others decide to continue along the Wall onto Tower 22 which is probably the hardest part of the Mutianyu section as it leads steeply uphill here. 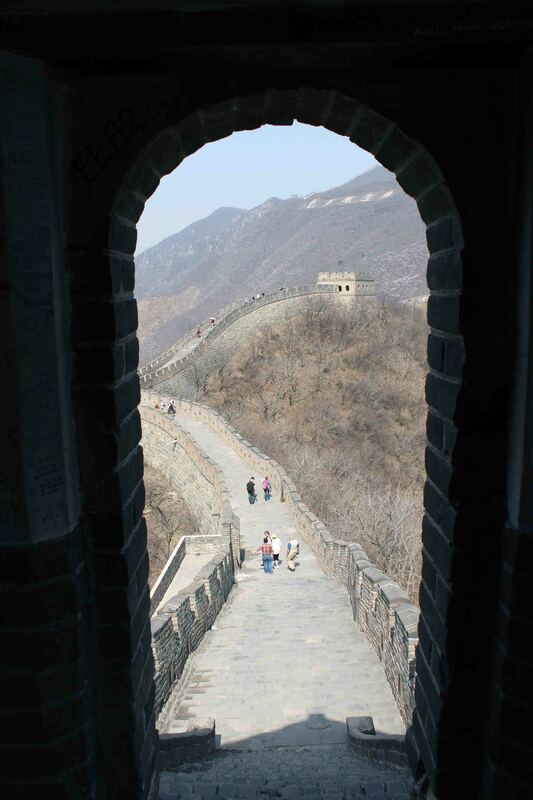 When heading back towards Tower 6 I am walking with Petra, the other german. Along the Wall we take photographs of each other, and therefor also climb on the tops of the Towers. 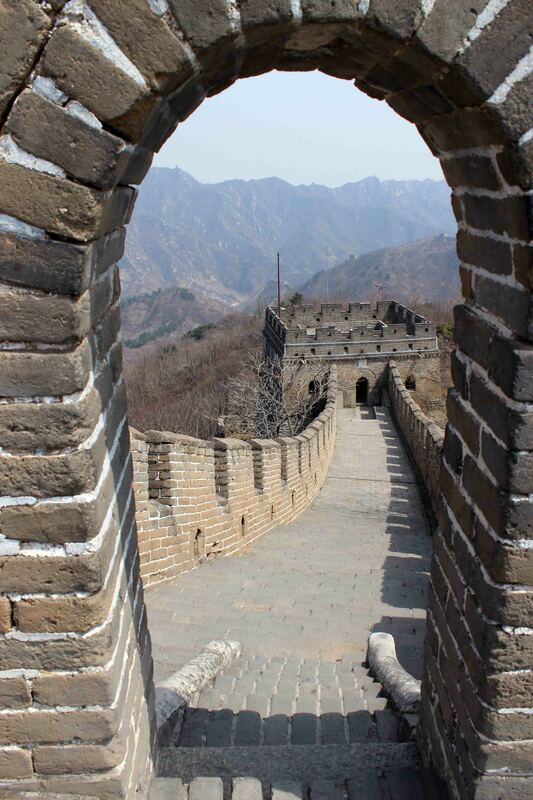 Eventually we reach the stairs and descend the many steps. Others of our group take the Cable Car or the Tobboggan or walk down like us. Back in Beijing Leon takes us to a huge chinese department store, where you can buy almost all sorts of chinese items one can imagine, as some of our group have explicitly asked him for that. Afterwards he guides most of the group through the Temple of Heaven complex. I have been there already three days ago, so I decide to go into one of the Malls nearby our hotel instead. As I have not eaten almost anything yet for the whole day, I am really hungry. In the food court of the Mall I am facing lots of food stalls where, like all over Asia, food is freshly cooked right in front of the client. I only want to eat a snack as Leon will take us for a Beijing Duck dinner tonight. None of the staff at the food stalls speaks a word of English. When I point on some self made Wontons which will be served in a soup, the lady in front of me starts to gesticulate eagerly. After a while I understand that I have to pay first at the main counter next to the entrance area before I can order my food. The cashier there only speaks chinese either. For about five to ten minutes I am struggling to explain her what I want, but she doesn’t seem to understand me. Eventually she pulls out a sign with detailed instructions in English, so that I can finally upload money on a plastic card, pay and get my food. The Wontons are prepared in front of me. Each one of them is handmade and boiled in hot water before I get it served in a broth. They are absolutely delicious and the perfect snack in between. At 7 P.M. I meet my group again in the hotel lobby. We take a public bus to get to the restaurant. From the bus stop where we have to get off, we walk into a hutong. The streets are dark and we make several turns. Without a doubt, every non-native would get lost here within seconds. Eventually we reach a small local restaurant with a courtyard. Leon has reserved a private room with two tables for our group. Before dinner we have the chance to take a look how they prepare the Duck. The Beijing Duck is then served to us in three parts: the roasted skin, the meat and a third part, which consists of skin and meat, are brought to our tables on seperate plates. Furthermore we get ultrathin pancakes, cucumber pieces, spring onions, bean sauce, sugar and garlic paste. Leon demonstrates us how chinese people would eat the Beijing Duck. All ingredients including the roasted skin and the meat are wrapped in the pancakes and eaten together. Additionally Leon has ordered further dishes per table; a vegetable dish with aubergines, chicken with peanuts, deep-fried pork and beef, which is cooked on a hot stone. The food is fantastic and more than plenty; it would have probably been enough to feed twice as many people as we are. On the way back from the bus stop to our hotel Leon shows us a place where he intends to have breakfast tomorrow morning and he invites us to join him before we’ll head off to the Tiananmen Square and the Forbidden City. After saying goodnight to my travelmates I take a seat in the internet corner of the hotel lobby to write a few emails. As the battery of my laptop is almost flat, I ask a lady who sits next to the power outlets if I may take a seat on her table. She is just struggling with her G-Mail-Account and asks me if I am facing the same problem, but as I am using a different provider, mine works fine. Soon we get into conversation. Her name is Jane and she is from Boston. 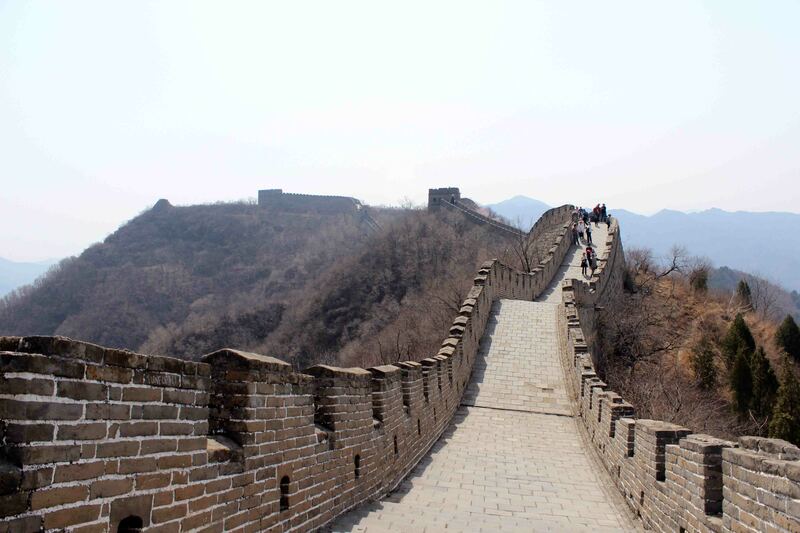 She has come to Beijing together with her son who is on a concert tour together with his youth orchestra, giving a few concerts in and around Beijing. 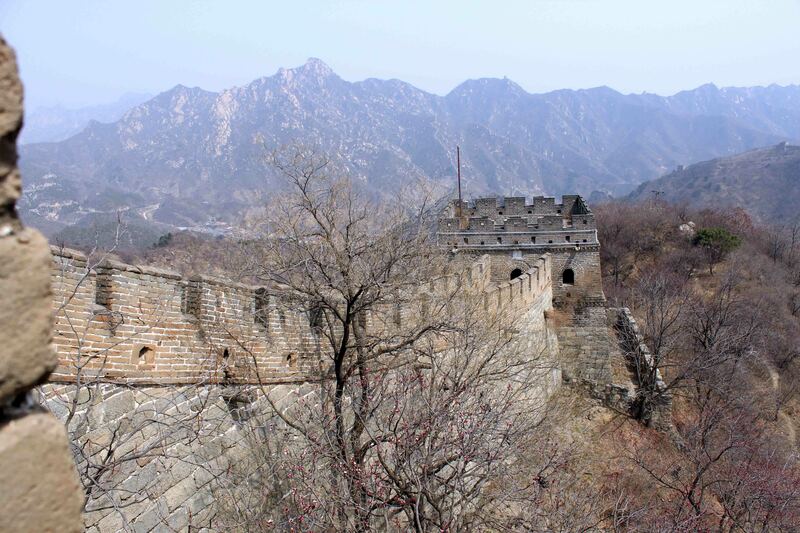 Jane and I find out that it is our first visit in Beijing, but that we have both been to Tibet before. 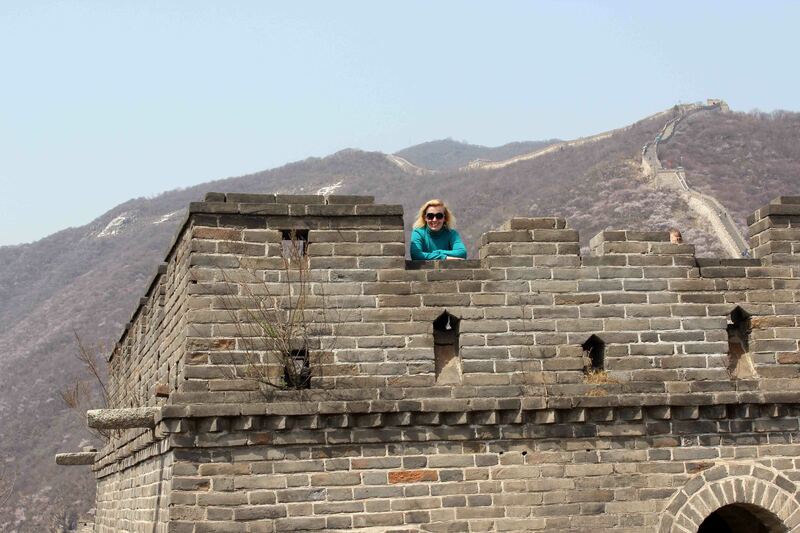 She has flown into Lhasa together with her daughter a few years ago, hired a private guide and a driver. They spent a few days in Lhasa and took a a full day excursion to the Ganden Monastery, one out of the three most important monasteries of the tibetan Buddhism which is located 50 kilometres east of Lhasa. Jane and I have a good talk and a few minutes turn into one and a half hours, so that it is quite late when I eventually fall into my hotel bed. Unfortunately I had forgotten my camera when we went to the Beijing Duck dinner, so that I don’t have any photos of that evening. 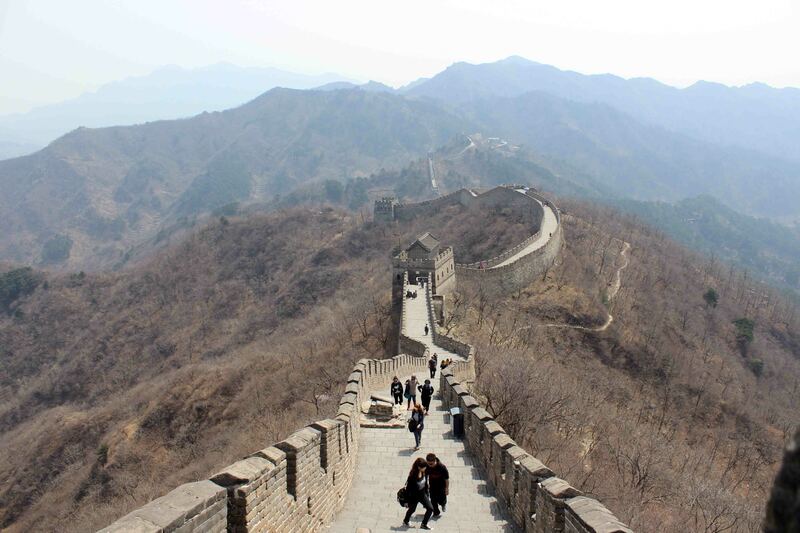 Have you ever been to the Great Wall? Which section did you visit?